GuitarControl.com released a new video guitar lesson from GuitarControl.com instructor Darrin Goodman. In this guitar lesson, now available on YouTube.com, Darrin Goodman teaches a guitar lick that combines sweep picking and string skipping. 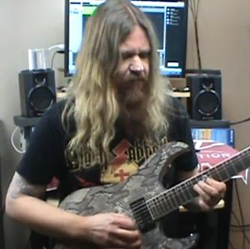 Darrin demonstrates this shred lead guitar lesson in the key of Em that combines sweep picking and string skipping as follows. 19th fret of the first string with 4th finger and then a pull-off to the 15th fret with first finger to the 17th fret of the 2nd string with 2nd finger to the 16th fret of the 3rd string with first finger and then ascend back up to the 15th fret of the first string. Next Darrin moves to the second arpeggio by starting on the 17th fret of the first string with 4th finger and then a pull-off to the 14th fret with first finger and then to the 15th fret of the 2nd string with 2nd finger and then to the 14th fret of the 3rd string with first finger and then ascend back up to the 14th fret of the first string. For the third arpeggio Goodman simply repeats the second shape one whole step lower. Next Darrin moves onto the string skipping section and demonstrates how to perform it as follows. 14th fret of the first string with 4th finger to the 12th fret with 2nd finger and then to the 11th fret with first finger and then repeat this sequence on the 3rd string. Next is the 13th fret of the 2nd string with 4th finger to the 12th fret with 3rd finger and then the 10th fret with first finger. Darrin continues this lead guitar lesson with the rest of the string skipping section as well as some more sweeping arpeggios. Guitar TAB’s are available for this lead guitar lesson at GuitarControl.com. An arpeggio is when the notes of a chord are played separately in a sequence. The word comes from the Italian word apeggiare which means “to play on a harp”. Darrin Goodman, a native of Ogden Utah, began playing guitar at the age of 12 after hearing KISS at an earlier age. Darrin has been a local finalist for the King of the Blues contest and is the lead guitarist of international recording artist Sonic Prophecy who has performed with artists such as Accept, Sabaton Cinderella and Ratt. Darrin has been teaching private lessons to 30 to 60 students a week from his home studio since 1987.